Oh, my heart is in Savannah, there’s somethin’ ’bout Georgia manors that got me feelin’ like, Ooh-ooh-ooh, enough! There’s no arguing that Savannah is a gorgeous city, perhaps the most beautiful town in the United States, and host to last month’s 26th annual Congress for the New Urbanism. We enjoyed good traffic at the VSI Innovation Booth, were representatives of Progressive Foam, Kaycan, Boral, and Royal Building Products displayed their most innovative and architecturally appropriate products for attending architects. In the photo, principals Korkut Onoran and Ronnie Pelosi of Pel-Ona Architects & Urbanists visit the booth. These two architects wrote the design standards for 1,500 single family homes in Stapleton, Denver, and 3,500 single family units in Barefoot Lakes, Firestone, Colorado. Founded in 1993, the Congress for the New Urbanism advocates for real estate developments that support walkable, mixed use communities framed by architectural design celebrating local history. The Congress chose Savannah for its 26th meeting because the city exemplifies the values of the New Urbanism, including walkability and traditional neighborhood design. Newer communities, such as University Place in Memphis, Celebration and Seaside in Florida, the redevelopment of San Antonio, Stapleton in Denver, and hundreds of other cities have recreated the land-planning and architectural styles prevalent before the post-war automobile-suburbs of the late 1950s. Unfortunately, these New Urban and most popular of community trends, by and large, reject our polymeric claddings. Thus, the Vinyl Siding Institute and a handful of dedicated members set up an Innovation Booth at this year’s Congress, to show and tell designers and land planners how our products can fit into, and even benefit, their architectural vision. As a trade association, we have attended the annual Congress for nearly 15 years. This year was different. Responding to our recent engagement with New Urbanist thought leaders, Steve Mouzon and Andres Duany, VSI updated its brand to better suit New Urban tastes. The makeover paid off, with more Congress attendees approaching our tables for information than prior years, and a surprise visit by John Torti, of the storied New Urbanist architectural firm, Torti Gallas, who dropped by the booth to congratulate each of us with a personal handshake. 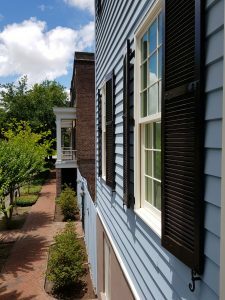 Walking along the shady streets of historic old Savannah I spotted many buildings with polymeric shutters and aluminum hardware. Boral set up at the VSI Innovation Booth and exhibited their poly-ash shutters, trim, and TrueExterior™ products. 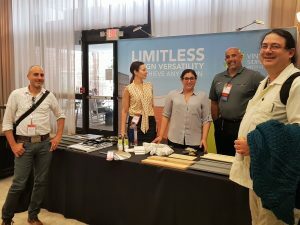 This year, five polymeric product manufacturers joined VSI staff at the booth, networking with New Urbanist designers and showing off products many architects didn’t know existed. For example, working shutters that perfectly reproduce wood, panel profiles in colors, widths, and material characteristics that can compete head-to-head with fiber cement and composite wood claddings. VSI also sponsored two lunches for the New Urban Guild, the most influential architectural group within the Congress, designing many if not most of the housing built by New Urban Town Founders (a nice way to say, enlightened developers). This group of architects most directly influences decisions on exterior cladding. Each of the VSI sponsored lunches enjoyed attendance by about 100 working architects. First Andres Duany and then Steve Mouzon introduced VSI with praise and fanfare, thanking us for the sponsorship and our industry’s efforts to improve products. This put the audience in a receptive mood, while Jason Culpepper, of Progressive Foam, spoke for the industry, thanking the architects for their efforts to improve our communities and voicing our industry’s commitment to supporting their efforts and developing products useful to their mission. Although the New Urbanists have become immensely influential in planning codes, the movement was founded by architects and their codes address the character, or look of a place, as much as traffic patterns land use. The interface between our manufacturers and New Urbanist designers has become critical to maintaining our industry’s leading position. A position that has slowly eroded precisely because our products are associated with the post-WWII drive-to suburbs that have fallen out of favor. To get a sense of just how influential the New Urbanist architects have become, I took advantage of this year’s Congress to buy a few rounds of drinks. Sitting at a fancy eatery at a table with about 15 architects, I quizzed the five designers within earshot about how much of the business involved writing community zoning code and architectural standards. I was surprised to learn that this has become the bread and butter trade of most architectural firms, including the small ones. Cities, townships and neighborhood developers hire architectural “urbanists” to layout community plans, write zoning code and develop design standards. 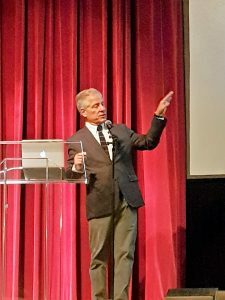 In two lectures, the king of New Urbanism, Andres Duany, spoke favorably of our industry – a huge turn from a thought leader that used to reject vinyl siding. I asked the five architects to email samples of the design codes they wrote for a few of the communities they had worked with. Two of the five responded and I read through the codes to see how they addressed exterior cladding. I also looked up the neighborhoods, to see how many units they represented. All told, between the two firms that responded, Wolff Lyon Architects and Pel-Ona Architects & Urbanists, the projects they sent me represented a whapping 5,500 units of single family housing in Colorado and Utah. These firms are small, and don’t have the influence of big shot New Urbanists like Calthorpe Associates, Duany Plater-Zyberk and TSW that write codes for metropolitan areas, such as DeKalb County in Georgia, the seat of Atlanta that represent hundreds of thousands of units—now under strict standards for vinyl siding. The new design code trends don’t look good for our industry. 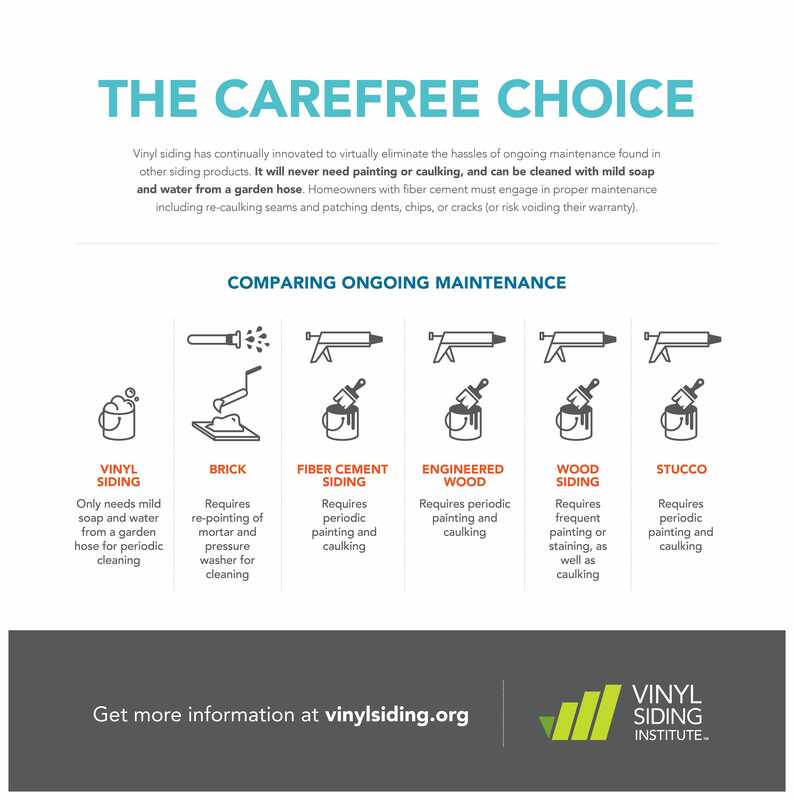 In all cases the architectural standards I looked at required solid siding without artificial texture—although none proscribed vinyl, where can you find smooth, solid vinyl today? Our industry can make smooth siding, and foam backing makes it solid, but manufacturers say consumers prefer the wood-grained material. I believe manufacturers see the preference for smooth faced siding as the pet peeve of a handful of architects, not realizing these selfsame architects influence design codes for thousands of homes. Our industry can respond. We can make products that New Urbanist and New Urbanist-influenced architects can specify—we proved this at the VSI Innovation Booth in Savannah. But it’s important to get the word out quickly, because every time a new code is written that directly or indirectly eliminates our products, we lose market share. So, next year, when the Congress for the New Urbanism moves to another southern gem, Louisville, Kentucky, let’s show’em what we’re made of, and get‘em feeling, like Ooh-ooh-ooh when they see us at the 2019 VSI Innovation Booth. Sorry. Can’t get that song out of my head.